Oval tazza; variegated agate, green, white and red; gold mounts with jewels and enamel; very thin bowl with two scroll handles, enamelled white and green, each held in place by oval gold plate in form of group of leaves, enamelled white and turquoise and black on gold; baluster stem with mounts enamelled in lavender, white, etc., set with rubies; base set in mount with borders of lavender and white; upon this four pearls and rubies in enamelled settings and eight sexfoils enamelled turquoise. Openwork. This object was previously owned by William Spencer Cavendish, and collected and bequeathed to the British Museum by Ferdinand Anselm Rothschild. Origin: Uncertain; previously described as 'French, late 16th century', but more probably only the agate bowl can be given this attribution. The restorations and replacement gold mounts were made before 1834 - perhaps in London, c. 1811-30. Provenance: Formerly in the collection of the Dukes of Devonshire; recorded in a manuscript “Inventory of Curiosities and Articles of Vertu at Devonshire House, 1834”; also listed under the heading of “Vases of Stones” in the 1892 Inventory of Devonshire House, London; lent by the 8th Duke of Devonshire to the Burlington Fine Arts Club Exhibition of European Enamels, 1897; acquired by Baron Ferdinand Rothschild about one year before his death in December 1898, along with four other hardstone vessels in enamelled gold mounts (see WB.68 – WB.71). Commentary: The above description of this tazza has been necessarily detailed so that many technical aspects of its construction may be recognised as incompatible with the sixteenth-century origin previously attributed to this object (in Read 1902 and in Dalton 1927). Only the extremely thin and evenly carved and polished bowl can, with confidence, be accepted as the product of a Court workshop of the early seventeenth century, but whether in France or in Northern Italy (perhaps Milan) is impossible to determine, because the bowl is entirely without decoration. In almost every respect it compares closely with the jasper bowl in the Treasure of the Dauphin in the Prado, Madrid (see D. A. Iñiguez, ‘Catálogo de las Alhajas de Delfín’, Museo del Prado, Madrid, 1989, p. 103, no. 58, col. pl. ; also, a reproduction of the old photograph of 1890 showing it complete with its (now lost) two handles and mounts). The 1890 photograph is particularly informative because it shows how very similar the present appearance of the Devonshire bowl is to the original version of the bowl in the Prado. However, it also reveals one very important technical difference: although each of the handles was originally attached to the Madrid bowl by means of a pierced gold plate (similarly fitted over the rim, with half on the inside and half on the outside of the bowl), nevertheless there would have been no rivet to secure it in position because it was linked by a vertical strap-mount (extending from below the handle) to the foot-rim mount at the base of the bowl - that is to say, still using a traditional medieval and Renaissance technique. The main superficial similarities between these two mounted bowls are, however, striking, although perhaps not as great as with a plain agate two-handled bowl from the Cardinal Mazarin collection in the Galerie d'Apollon in the Louvre (inv. no. MR. 238; see D. Alcouffe, The Collection of Cardinal Mazarin’s Gems, ‘Burlington Magazine’, CXVI, 1974, p. 518, no. 418, fig. 19). However, the pierced openwork design of the beautifully enamelled handles on this Paris bowl is typical of the style of foliate ornament in fashion at the French Court in the second and third quarters of the seventeenth century. By comparison, the pseudo-Renaissance openwork scrolls of the handles on the London tazza seem 'incorrect' for the later style (and pale palette) of the enamelling, which is clearly derived from the well-known homogeneous series of French enamelled gold mounts of foliate design that distinguish so many pieces in the Louvre and Prado and probably date from the second and third quarters of the seventeenth century. 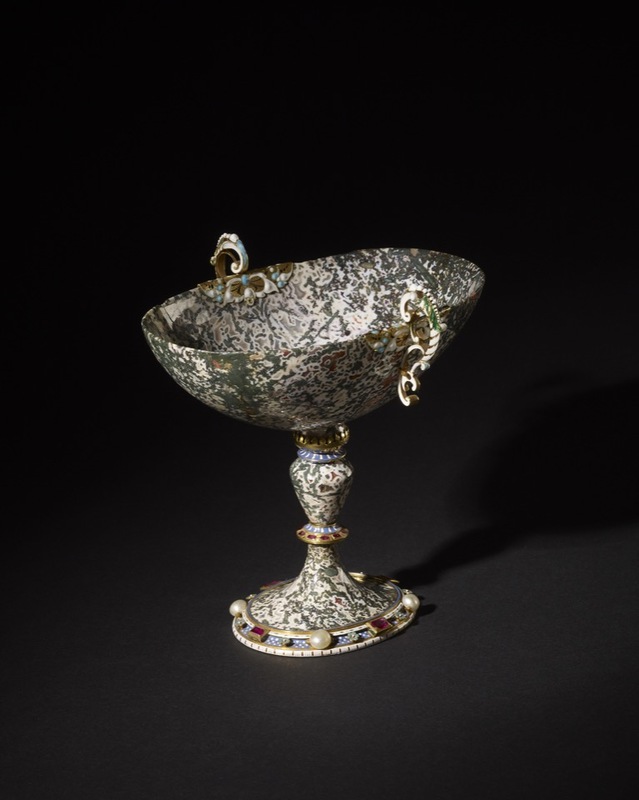 However, the modern parts of the London tazza have a very special interest and value because they had already been added before 1834, when the piece was very briefly listed in the Devonshire House Inventory as “variegated Green White Jasper Tazza with Gold Enamel mount, enriched with Pearls and Rubies”. By the time it was more carefully catalogued in 1897, when the 8th Duke first lent it for public exhibition, it was optimistically stated to be “Italian, 16th century” and, more helpfully, it was noted that “the agate somewhat resembles a moss agate in general colour . . . and is of a kind not at present available”. In the absence of any mention of this piece in the 1811 Inventory of Devonshire House nor in any of the pre-1834 records at Chatsworth, it may be assumed that the 6th Duke of Devonshire (born 1790, inheriting title 1811, died 1858) was responsible for its acquisition in its present state or for commissioning its restoration and lavish embellishment. (His activities as a collector, especially his known interest in hardstones and mineralogical specimens, gems, marbles, and so on are discussed in the Curatorial Comment of WB.68). (i) The mechanical almost razor-sharp, character of the pierced openwork handles, the undamaged, thickly encrusted enamels, and the drilling of the two rivet holes in the sides of the bowl, all of which are indicative of modern manufacture. (ii) The use of a curious lavender-coloured enamel and on the foot-rim the added effect of a geometrical pattern of enamelled dots (white, ruby and gold), neither of which is characteristic of the documented examples in the major Schatzkammern. (iii) The mounting of the pearls (on the foot) in 'cradles' in the medieval fashion and, in addition, the meticulous cutting of four arcs along the inner raised border of white enamelled gold to accommodate the curving outline of each pearl; similarly, the meticulously executed interruption of that white enamelled design at the four cardinal points to accommodate the upper side of each of the rectangular gold settings, which have had to be provided with a narrow box-like sub-stage (within the trough). (iv) The pinning (through the gold foot-rim mount) of the eight tiny flowers, each made with a separate but identical six-petalled disc that can be revolved at the touch of a finger. Nevertheless, this anonymous goldsmith seems to have been particularly well informed about the French style of enamelling on gold mounts during the 1620-70 period, as his own mounts on either side of the agate bowl vividly demonstrate; indeed, certain technical aspects of his work establish his superiority as a copyist over most of the fakers of the second half of the nineteenth century, including Reinhold Vasters of Aachen. If, as seems probable, the original stem and foot might have disappeared at the time when the bowl lost its original mounts and was broken, this gifted goldsmith may have sought to re-create (on a smaller scale) the distinctive character of Jan Vermeyen's gem-set and gold mounted stem and foot of the famous Rudolph II prase tazza and cover (see R. Distelberger in ‘Prag um 1600: Kunst und Kultur am Hofe Kaiser Rudolfs II’, Kunsthistorisches Museum, I, Vienna, 1988, pp. 472-3, no. 344, col. pl. 74, where the stone-cutting is attributed to the Miseroni workshop in Prague after a design by Jan Vermeyen (Brussels, before 1559 - Prague, 1606) and where the finished object (executed in Prague between 1600 and 1606) is identified with no. 1437 in the 1607-11 Inventory of Rudolph II). Although the baluster stem is less elongated than on the Vienna prase covered tazza, the profile of the steeply curving graceful foot is strikingly similar - and even the gem-set mounts on the stem and foot are closely related, although the detailed ornament is wholly different. Undoubtedly, in the pre-1834 era a restorer would have had to rely on a precise drawing of the Hapsburg prase covered tazza in order to carry out such a reconstruction. Whilst such drawings were in existence - as, for example, the Chatsworth ‘Agathe Orientale’ drawings from Lord Burlington's collection (see WB.68) there can be no certainty that this agate foot and stem are not the originals set in new mounts. Both the foot and the stem may have been damaged at the edges at that time, and consequently needed to be ground down, thereby resulting in some slight loss of harmony in the proportions and outline. Unfortunately, there is, as yet, no means of identifying this gifted goldsmith or the products of his workshop, although it remains a strong possibility that he might have been active in London under the Regency and during the reign of George IV (1820-30). Hugh Tait, 'Catalogue of the Waddesdon Bequest in the British Museum. III. The Curiosities', British Museum, London, 1991, no.18, figs. 225-229.